This is, by far, one of the coolest posts I've ever seen. so this is our gift to you. 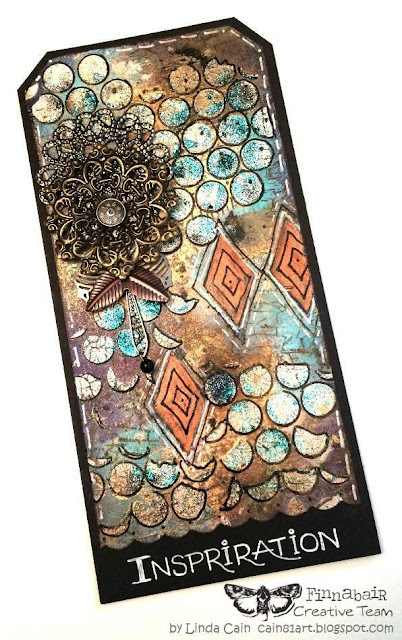 It's a relatively simple tag using crackle paste, stencils, glitter, mica powder and several mechanicals layered together. Words cannot describe how beautiful and different they all are. P.S. You're going to LOVE them! This little project starts with an Altoids tin with the lid removed. I've seen these little Works of Art created by others and have always wanted to try one, so here goes!!! I traced the bottom of the tin onto a piece of adhesive backed metal from Ten Seconds Studio. Cut it out and then run it through the Vagabond using the Iron Scrollwork Embossing Folder from Vintaj and Sizzix. I used Deep Water Mica Powder as well as Purple mixed with Soft Gloss Gel to make a paint. These 2 colors were painted onto the recessed areas of the embossed metal. When dry, I used a light sanding block to remove excess paint, and polish. Black and Copper Micro Beads are glued into the indentations of the metal with Soft Gloss Gel using a Precision Tip Applicator. I lightly sanded the tin and then gave it a couple of coats of Heavy Black Gesso. Spread a medium coat of both Copper Crackle Texture Paste and Antique Silver Crackle Texture Paste sporadically on the sides of the tin. While it's still wet, I added Black Micro Beads and set aside to dry. This is what it looks like when dry. The tiny cracks are amazing. I tore a strip of the White Resist Floral Pattern Canvas and added color using Distress Stains. Remove the backing on the embossed metal and apply to the back of the tin. I used 2 medium sized wooden blocks to raise the Resist Canvas and glued it into place with 3D Matte Gel. The Gold Mica Powder and Soft Gloss Gel were used to paint the Medium Mechanical Flower. 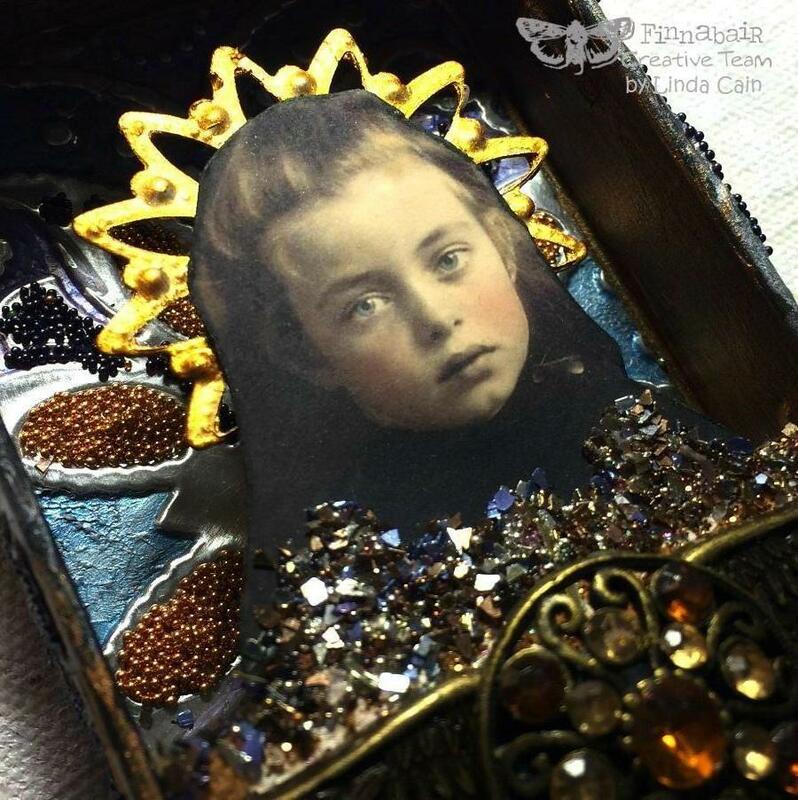 I glued the flower onto a small wooden block to raise the image away from the back of the tin. Glue in the tin with 3D Matte Gel with the photo. This detail shot shows my "Glitter Stash" that's added to the bodice of the girl and bottom edge. This is a collection of left-over Glitter, Glass Glitter and Micro Beads that I keep in a container and use as filler. The Large Flower Mechanical is trimmed and bent in order to add it to the top of the tin. A bit of Silver wire and a vintage typewriter key J adorn the top. J is for the child I lovingly named "Jane." 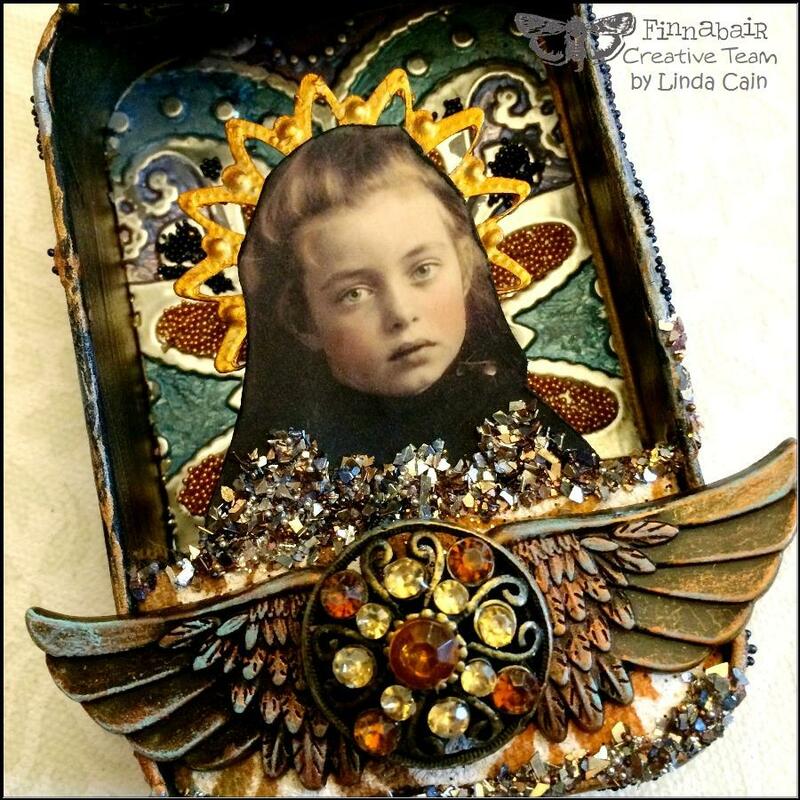 The large Wings are embellished with some waxes and a vintage button at the base. I hope you've enjoyed this journey and are inspired to decorate a tin for yourself or a friend. Be Well and Happy Holidays to one and all. Just a short post to show you a really simple and easy gift to make for someone special on your list. Adding them to a piece of silver chain and ending with a clasp from your local hobby or bead store is really easy. So, check out the links, and get busy. Kristin will fix you right up! that are going on the tree or to new homes. This is my favorite, Style 3, that's hand-painted. She has Gold Rush Glass Glitter Wings and Charcoal Art Sugar on the Star. The Star is really stunning in person. It's a dark gold, extremely fine glitter. They all have wires added to hang them on the tree, and paper clay faces using the Art Doll Push Mold. This one has Glittered Jingle Bells on the wire as well. 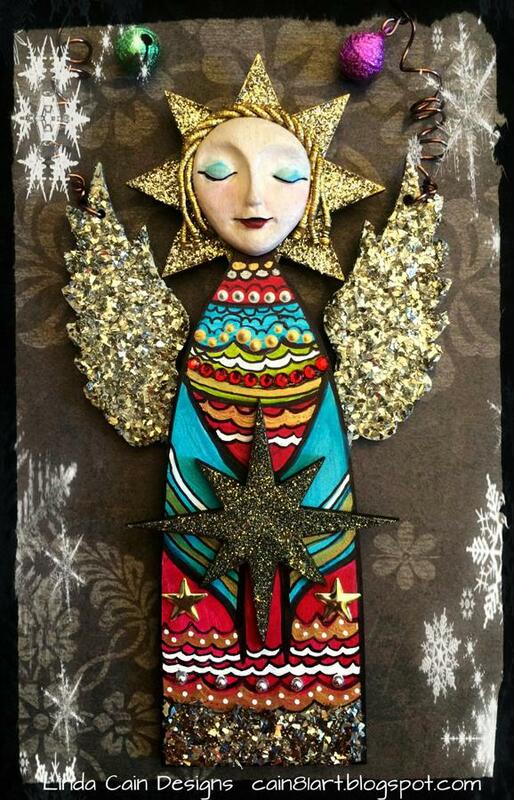 I used scrapbook papers, trims, glass glitter and glitter on this little Primitive Angel. I tend to switch the wings around. She found a new home today with Michelle. in her hands and Sterling Glass Glitter Wings. 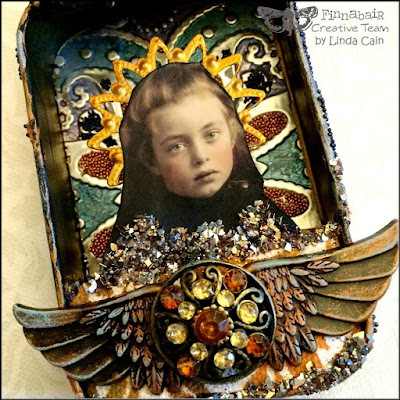 These tiny little black chipboard Art Angel Dolls were so fun to decorate. made from Santos Halo Cut Outs and Glitter. but they don't shine well here. 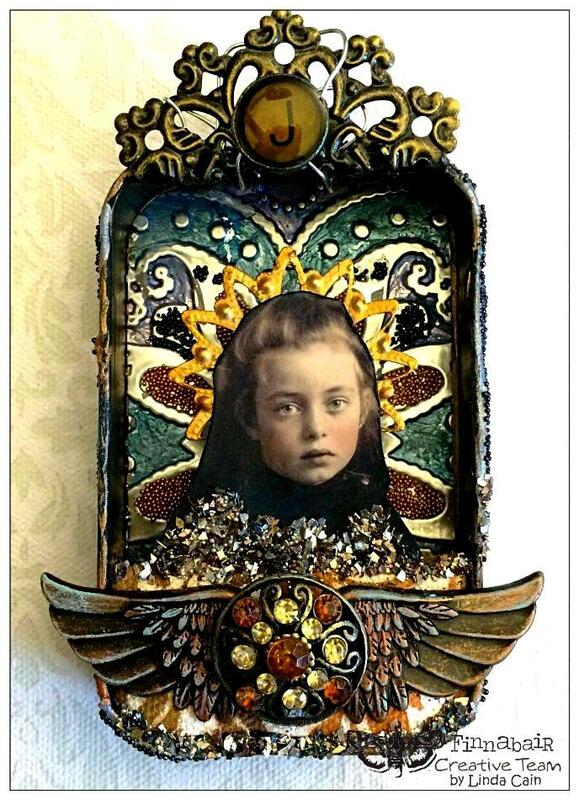 And Noel has a mixture of Gold Rush and Sterling Glass glitter on her wings. Both have a Christmas Word Collage sayings on the front. So get out your papers and paint and get started. They are addictively fun to create!